Custom Printed Back Boards for the Hamilton County Fire Department. 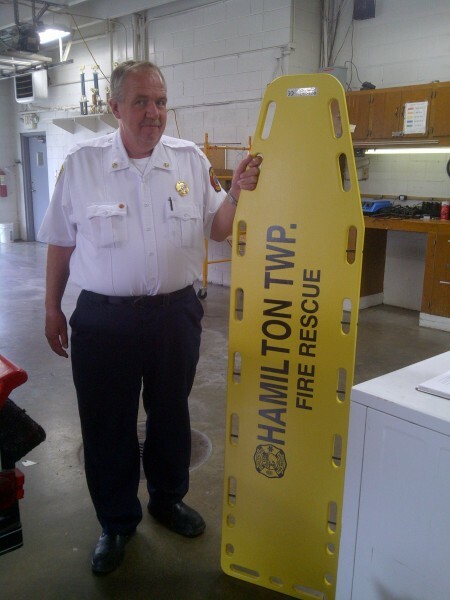 Hamilton Township Fire Chief, Mark Greatorex, took delivery today of 10 custom printed Back Boards from Signco/Stylecraft's customer, Scott Ackerman. Scott Ackerman, with SAMECA USA, has worked with Fire Departments all over the tri-state area and now provides them with their personalized department name on the life boards which often get misplaced without it. This is one example of a large custom printing that Signco is capable of. Signco has custom made screens to fit table cloths, large signs, banners, etc. Signco does a number of services for these fire departments other than just Back Boards. We print custom t-shirts, shorts, sweatshirts, sports wear, as well as embroidering zip-ups, beanie caps and more. Call us and ask what we can do for you and your fire department!